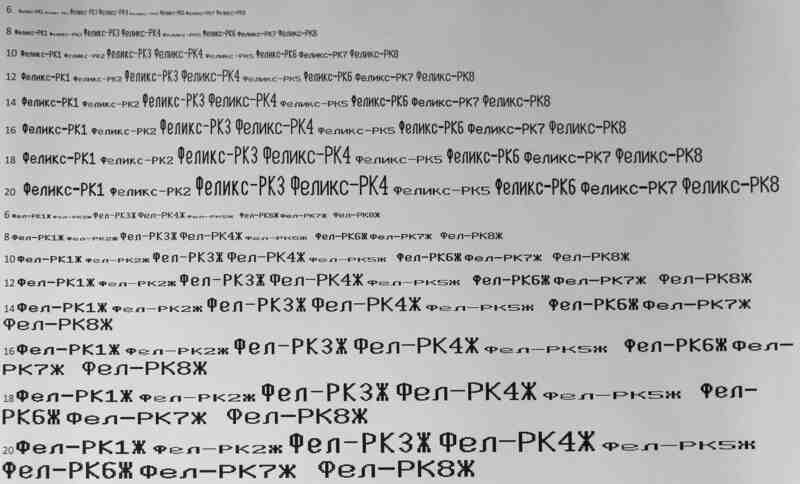 This full set of FELIX-RK cash registers contains 8 versions of fonts (1-8) in TTF format (Russian and English letters) for use in the Microsoft Word program. In the archive there are standard and wide fonts for each version (only 16 fonts) in TTF format and templates for check options. Often, shops use in one check several types of fonts in order to protect the check against forgery. This set will allow you to repeat any check printed on this unit, in particular LEROY MERLIN, CARAVAN, RUBLE BOOM, etc. You just need to install the fonts in the system (usually C: \ WINDOWS \ Fonts), open the template and start editing. Print checks preferably on a thermal printer, on the cash register tape. Although it is possible to print both on a jet and laser, with the possibility of output on fax paper. The best quality, of course, when printing on thermal printers. В Word всё хорошо отображается при размере 14 и 20. Но плывут (меняют геометрию) при 16, 18 и иных промежуточных значениях. При печати на принтере ни каких изменений геометрии нет. Всё четко и правильно. Готов рекомендовать. Спасибо! Отличная работа, качественные шрифты! Отлично! Как раз мой случай. Сисадмин запихал в чек 4 версии шрифта. С помощью этого набора повторил чек 1 в 1! Спасибо продавцу за инструкцию по QR-коду и по штрихкоду. Продавца рекомендую!